Grandson of Johann Sebastian Bach and son of Johann Christoph Friedrich Bach (1732-1795). He was educated by his father and by his uncle Johann Christian Bach (1735-1782) in London. There he made himself a name as a musician and as a teacher. After his uncle's death he travelled to Paris and the Netherlands before he became musical director in Minden. King Friedrich Wilhelm II engaged him in Berlin in 1789 and after the king died in 1805 he became musical director for queen Louise of Mecklenburg-Strelitz. In 1811 he retired after prince Heinrich, King Friedrich Wilhelm III's brother, granted him a pension. Little of his work has survived. In 1843 he met Robert Schumann when the Bach monument in Leipzig was unveiled. He died two years later. 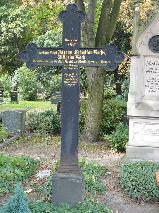 The grave of Wilhelm Bach at the Evangelischer Friedhof der Sophiengemeinde II, Berlin.